Do you have a tea-like water that may also smell? This is the system you are looking for. 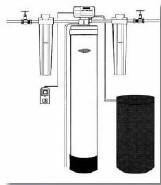 Tannin Removal Water Purification System is a Self-back-washing Residential Systems that automatically remove the tannins from drinking water using specially designed media. 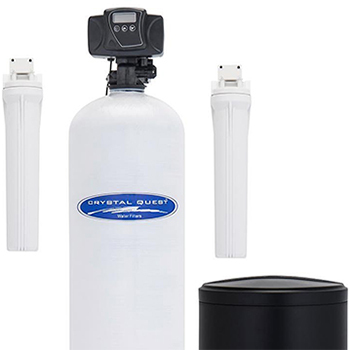 The system connects to the main line of your home or business and can also remove sediment, chlorine byproduct, VOCs, pesticides and herbicides. Main tank is designed to remove Naturally occurring organics that make water look brown or tea-like. These are common in low areas near lakes, rivers and swaps, but may also occur in other places due to biological decay such as leaves, and naturally occurring iron. SPECIFICALLY DESIGNED TO REMOVE NATURALLY OCCURRING ORGANICS (NOM). 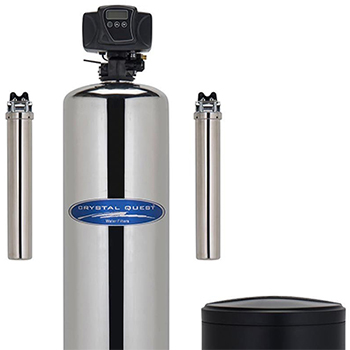 COMPLIES WITH FDA REGULATIONS FOR POTABLE WATER APPLICATIONS. Regeneration: Just add sodium or potassium pellets to the brine tank. 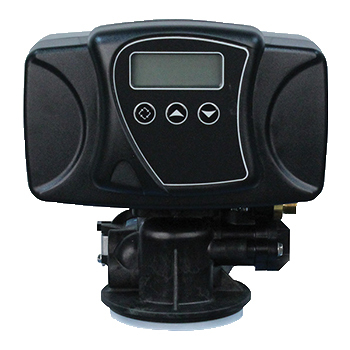 Requires a nearby power outlet for the control valve to run periodic regeneration cycles. 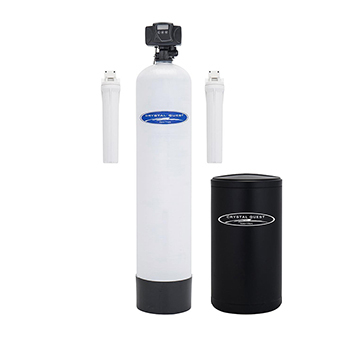 Maximum Removal Capacities: 5ppm Tannins, will work in water with up to 40 grains of hardness. Maximum Iron and Manganese Levels: Combined Manganese and Iron levels must be below 0.2 ppm. If Iron , Manganese or Hydrogen Sulfide (rotten egg smell) is an issue, consider an iron removal system instead. 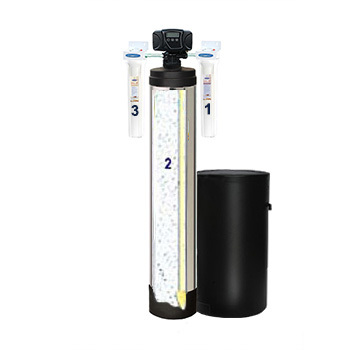 In Third stage, water travels through a 20" solid carbon cartridge for a final conditioning of the water and removing volatile organic compounds (VOC's), insecticides, pesticides and industrial solvents. REVERSIBLE EXCHANGE OF ORGANICS – LONG LIFE. Provides unequaled capability to reversibly remove naturally occurring organic matter. In this regard it is far superior to normal anion exchange resin. NO FISHY ODOR Gives very little or no fishy odors even in applications where other resin types such as acrylics fail because of odor. The longer time that the water is in contact with the media, the more effective is the conditioning and filtering of the water. Solid Fiberglass or Stainless Steel tank filled with Tannin reducing media. Maximum Flow Rate: 12 gallons per minute. 1" Stainless Steel Bypass Valve (connects to 1" main ; 3/4" is also available, inquire or note during checkout ). This is a self-backwashing Microprocessor Control system that automatically removes the trapped contaminants within the filter bed and washes them down the drain. 5 years on Fleck Backwash Control Valve.